Door stile blanks and door stiles are composed using LVL (laminated veneer lumber) engineered wood. This provides a stronger, straighter, and more uniform product that is much less likely to warp, twist, bow, or shrink than conventional lumber. 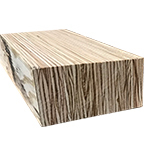 Stile blanks are offered in 4 thicknesses (1-1/8”, 1-3/8”, 1-7/8”, and 2-1/4”) all in 3-3/4” widths by 98” in length. Blanks are intended for you to add your own veneer and edgeband with the species of your choice. Door stiles are offered in multiple species, in a variety sizes. Knotty alder and select poplar are our most popular. Door stiles are made by covering stile blanks with 3/4” edgeband on each edge, and a 3/16” thick veneer on both face and back. Custom sizes and species are available for quote.